Forge by Laurie Halse Anderson. Grades 5-8. Simon & Schuster Children's Publishing, October 2010. Reviewed from ARC provided by publisher at BEA. 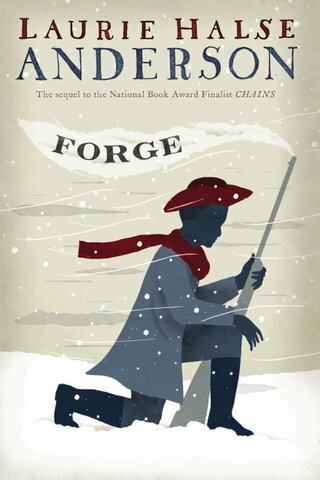 Taking place after the events in Chains, Forge continues the story of Curzon, an African-American boy during the Revolutionary War. After being fired from his work with a crooked businessman, Curzon finds himself in the middle of a battle between British and Revolutionary troops. He saves the life of a young American soldier by throwing one stone and he's chosen his side. Curzon gets swept up into the army life, joining a troop bound for Valley Forge. It'll be a hard winter and just when he thinks his luck has turned, surprising twists of fate will send Curzon back to where he started. So many Americans are fighting for freedom, but will they ever fight for the freedom of all? I loved, loved, loved Chains and I've been eagerly anticipating this sequel since I finished that book in 2008. The good news is that it absolutely doesn't disappoint. The bad news is that it's only made me want the third book just as badly as I've wanted this book! Just like Chains, this book explores a part of the Revolutionary War that we might not always think about - the roles of slaves in the fight for American freedom. And like Chains, the book is compulsively readable with characters that feel like real people. It's less like reading a historical novel and more like your good friend Curzon is sitting there and telling you about his adventures. Not only is it compulsively readable, but the book is rife with historical details that bring the Revolutionary War to life. Ms. Anderson starts each chapter with a quote from primary source materials. This is something that kids might skip over in their hurry to continue the story, but it adds so much when you take the time to read them. I'm reviewing from an early bound galley, so I didn't see the author's note, but I would bet a million dollars that it'll be fantastic (the author's note for Chains made my heart skip a beat). Can you read Forge without having read Chains? Yes, I think you can. Curzon occasionally gives the reader glimpses into some of the events of Chains with brief flashbacks and you don't need much back story for the events in Forge to make sense. But why in the world would you deny yourself the pleasure of reading Chains? Teachers, if you do a Revolutionary War unit for middle-schoolers, DON'T MISS THESE BOOKS. I can't think of a more accessible way to introduce the time period and get your students thinking. Go ahead and pick up Chains today, but Forge won't be on shelves until October 19.